Two Years after the Rana Plaza Tragedy: What Has Changed? Note: the followings updates are compiled based on the 2015 Bangladesh Development Conference held from June 5th to 6th at the Harvard University. The conference attracted over 100 attendants and speakers from various aspects of the apparel industry, government agencies, international organizations, non-government organizations and academia. 1. Overall, the industry side argues that tremendous efforts have been made to improve work safety in the Bangladesh apparel industry and things are gradually improving. However, representatives from some labor unions say that changes are not happening fast enough as they should. In addition to the regular inspection conducted by individual fashion brand or retailer, the Accord on Fire and Building Safety in Bangladesh (the Accord) and Alliance for Bangladesh Worker Safety (the Alliance) were established in 2013 respectively (mostly funded by western apparel brands sourcing from Bangladesh) to maintain minimum safety standards in the Bangladesh apparel industry. The Accord has a total five-year budget of $50 million to be used on factory safety inspection and improvement. However, it is far from being clear what will happen after the Accord agreement expires in 2018 and whether the inspection achievements can be maintained afterwards. The International Labor Organization and International Finance Corporation launched the “Better Work” program in collaboration with Bangladesh government, apparel factory owners, workers, fashion buyers and other relevant stakeholders. The program intends to provide assessments of factory compliance with national law and core international labor standards, paired with transparent public reporting on findings. Nevertheless, some people argue that audit itself is not the answer to the problem, just like “a pig will not gain weight simply by weighting it; instead, we have to feed it.” Reflecting on the limitation of inspection and audit, they refer to compliance as just a piece of paper whereas ethics is something that keeps people awake in bed. Stick: the U.S. government decided to suspend Bangladesh’s Generalized System of Preferences (GSP) status in 2013 as a response to the Rana Plaza tragedy. Because textile and apparel are excluded from GSP, this measure has no direct impact on Bangladesh’s apparel exports to the United States. But the movement is symbolic and significantly increases the publicity of corporate social responsibility (CRS) issue in the Bangladesh apparel industry. Carrot: in comparison, the European Union chooses to continue providing Bangladesh its GSP benefits. As a GSP beneficiary, Bangladesh’s apparel exports to EU can enjoy duty free treatment when competing with other Asian suppliers such as China and India. According to EU, from 2008 to 2012 EU28 imports from Bangladesh increased from €5,464 million to €9,212 million (+69%), which is more than half of Bangladesh’s total exports. While granting Bangladesh the benefit, EU also launches the GSP Action Plan and the Sustainability Compact to encourage responsible businesses in Bangladesh. 4. Training has been provided for Bangladesh officials to help them better understand building safety requirements. 5. More apparel factories in Bangladesh now have their own labor unions. According to the local law, 30 percent of the labor force in a factory can form its own labor union, meaning theoretically one factory can have up to three different unions. There has been more open discussions on “worker/women empowerment”, “social dialogue” and “stakeholder engagement” in the Bangladeshi society as well. 6. Some creative financial incentive mechanisms are suggested to improve the situation, such as offering factories with better compliance record with more attractive interest rate for bank loans; and adding building safety clauses in factory insurance contract. Based on analyzing the factory inspection data, some scholars start to evaluate the effectiveness of the current inspection system (eg: does who pay for the inspection matter for the result? Does violation go down overtime in inspection? What is the role of on-going people to people relationship in inspection?). Some projects intend to develop an estimate of the true size of the Bangladesh apparel industry, given the fact that the worst work condition may exist in those undocumented factories. As a matter of fact, even the Bangladesh government doesn’t know how many garment factories they have in the country. Some scholars propose the idea of linking a company’s social compliance data with its business financial data to evaluate the business implication of CRS practices. Some studies compare the labor practices between Bangladesh and other developing countries in South Asia such as Cambodia and Sri Lanka. Some people suggest using case studies to develop hypotheses for a policy change. More and more studies are now conducted based on field trip and interview in Bangladesh. 8. 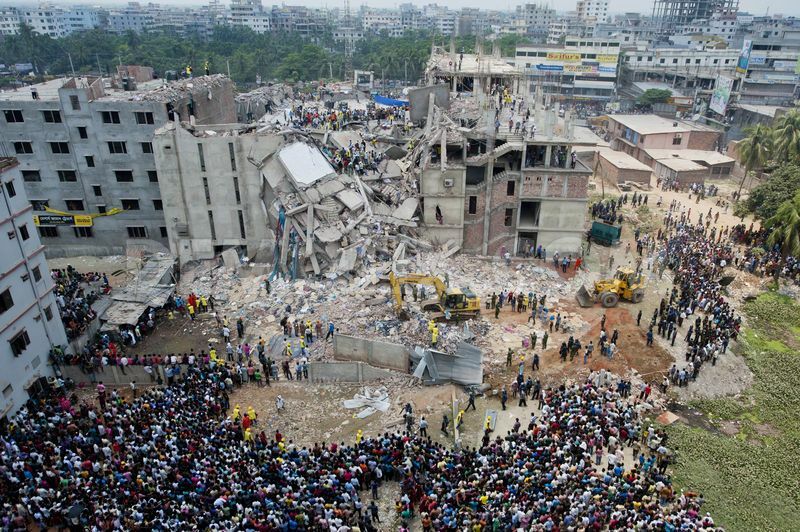 Criminal charges recently are filed against a dozen individuals and companies identified responsible for the Rana Plaza tragedy. 9. Response to the Rana Plaza tragedy has further led to a discussion on the broader economic, social and political reform in Bangladesh. Author Sheng LuPosted on June 12, 2015 July 24, 2016 Categories Trade policyTags apparel, Asia, corporate social responsbility, development, GSP6 Comments on Two Years after the Rana Plaza Tragedy: What Has Changed?